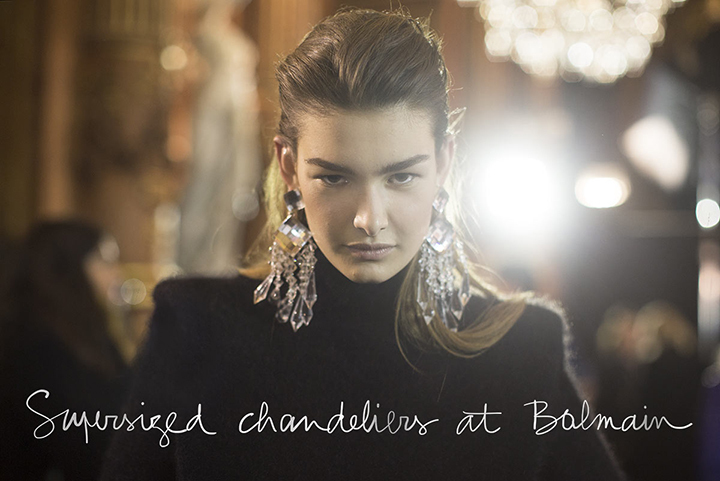 While Lanvin fascinated us with huge necklaces, Balmain keeps the vibe and brightens the new collection with oversized chandeliers. Balmain new collection for fall 2013 shouts luxury! No comfortable sweaters and loose skirts, only shining outfits for a true party girl. Square shapes and belted jackets are the hit in the new French design house’s collection. This time not glitter pants and jackets are in our radar but those oversized chandeliers that caught our eyes. We could not help but borrow the picture from Garance Dore’s who caught not only those amazingly shiny earrings but also the vibe of a fashion show together with a fierce model’s eyes. Get inspired by a Balmain party girl!